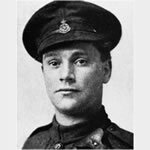 On 12 September 1918 near Laventie, France, when his company was held up by enemy machine-gun fire at short range, Lance-Corporal Wilcox rushed to the nearest enemy gun, bombing it and killing the gunner. Being then attacked by an enemy bombing party, the corporal picked up enemy stick bombs and led his company against the next gun, finally capturing and destroying it. Then, left with only one man he continued bombing and captured a third gun. Going up the trench, bombing as he went, he captured a fourth gun and then returned to his platoon.